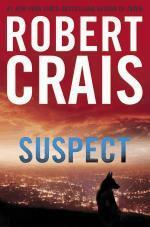 On this Memorial Day, I’m taking a breather from my intensive writing schedule to post a long-overdue mini-review of the book Suspect by Robert Crais. An LAPD cop survives a shooting that leaves his partner dead, and hunts for the killers while suffering from debilitating PTSD. That makes for some gripping, suspenseful drama. Said cop chooses a K-9 dog as his next partner, a military dog also suffering from PTSD, after watching her handler get blown up by an IED in Iraq. That makes for heart wrenching, gripping, suspenseful drama. Officer Scott James is the tough, stoic, determined protagonist, haunted day and night by the final words uttered by his dying partner. His grief and need for justice propel him through the sleepless nights, the chronic pain, his state of disgrace within his organization, and the apparent lack of leads in the case. USMC German Shepherd Maggie is a dog with “a problem” as one of the K-9 Platoon trainers points out. She reacts violently to sudden noises, is prone to aggression, and has a limp that Scott desperately tries to hide from the K-9 leader. Scott is instantly drawn to and rescues Maggie, knowing that she needs him, and even more importantly, he needs her. Reading Maggie’s journey made me remember my pit bull Piper, bless her heart, and really appreciate even more how our every move and every mood means the world to these dogs. The plot is pretty straightforward and clips along at a nice pace, and then I got to the part where things are heating up I was like “Crap! What’s going on? What’s going to happen next?” I hit this point while I was on my lunch break, and ended up getting back to work late because I couldn’t stop reading. There is a touch of romance in the book, too, as Officer James struggles with whether he can confide in and trust a female detective on the investigation. I love a little bit of romance in just about everything. The main love story, however, is between Scott James and Maggie. A man and his dog. What’s not to love about that?